An Educause project is examining the integration of 3D technologies — 3D scanning and printing, virtual reality and augmented reality — into education to create "extended reality." The "Campus of the Future" initiative, sponsored by HP but fully run by Educause, defines the concept of "extended reality" as a spectrum that stretches from the real world at one end to an immersive simulation at the other end. The project handed out VR-ready computers and workstations, high-resolution monitors, scanners and scanning turntables, 3D printers and VR/AR headsets to 11 colleges and universities. According to "Learning in Three Dimensions: Report on the HP/Educause Campus of the Future Project," participating schools were expected to use the technology "to conduct an active exploration of 3D technologies" in the classroom during the 2017-2018 academic year, "as a component of research projects, or both." All participants were already involved in using 3D tech in learning and research. But the idea was to identify the "leading edge" of the tech as a way to "project the future" of extended reality in higher education. For example, a project at Gallaudet University, a school primarily for deaf and hard-of-hearing students, is trying out the use of virtual reality to simulate auditory environments. A project underway there is attempting to find a substitute for the tedious process people with hearing aids experience, where they go out into the world to try on different "auditory environments" — a city block, a noisy restaurant — and then visit the audiologist to have their hearing devices tuned. In the Gallaudet initiative, VR is used to model those settings, allowing the experts to tune the hearing aid in a single appointment. As author Jeffrey Pomerantz, an associate professor of practice in the School of Library and information Science at Simmons College, asserted, the study was "one of the broadest, and most diverse" to integrate the use of 3D tech into higher education, "in terms of sample size, learning environments, academic disciplines and number of users." Participants filed biweekly status reports and went through a baseline survey and interviews to help the researchers understand the challenges and successes of the various projects. According to Pomerantz, all 11 institutions experienced great success in their use of the tech and found opportunities for future implementations. 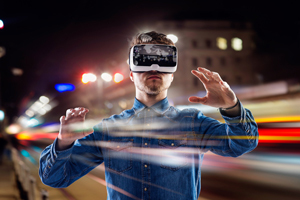 Researchers concluded that 3D technology is best used for experiential learning approaches that augment real-world examples, by increasing access to subject matter, concepts or locations that would otherwise be cost- or logistically-prohibitive. Simulations allow for scaling up of "high-touch, high-cost learning experiences." Students may be able to go through virtual lab activities, for instance, even when a physical lab isn't available. "One significant result from this research is that it shows that these extended reality technologies are applicable across a wide spectrum of academic disciplines," said Malcolm Brown, director of learning initiatives at Educause, in a statement. "In addition to the scientific disciplines, students in the humanities, for example, can re-construct cities and structures that no longer exist. I think this study will go a long way in encouraging faculty, instructional designers and educational technologists across higher education to further experiment with these technologies to vivify learning experiences in nearly all courses of study." View the full report and additional materials on the Educause website.